By the name of the salsa you already know that is Yucatecan although this recipe and this tradition is very different. When talking of Yucatecan food normally typical Yucatecan ingredients are used but this salsa is the exception because it is prepared with European ingredients... in fact the only Mexican ingredient that figures in the preparation is the epazote. To make the things stranger the white salsa from Yucatan is only used to bath a Yucatecan dish known as stuffed cheese. The curious thing about this dish is that it is prepared with Dutch cheese and is filled with beef picadillo. Definitely a dish that is not very Mexican however the objective of this whole preparation is to present to the diner a good combination of European ingredients with a Mexican touch. 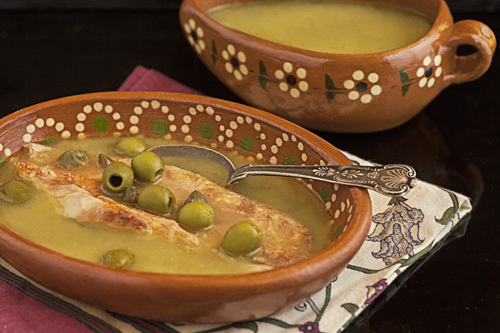 The white salsa from Yucatan is peculiar because it is thick and contains whole olives and capers . Its flavor is delicate and although it is only used in the stuffed cheese it could also be used to sauce up a white fish. Making the salsa is not difficult, it only is a bit laborious. The salsa is prepared with olives and they have to be bought unstuffed and preferably pitted. To thicken the salsa wheat flour is used and it cannot be substituted for maize flour because it will distort the flavor of the whole preparation. The recipe yields 1 qt. 1/2 cup of Hot Water (4.2 fl oz). Use hot water because in this way is easier to dissolve the flour. Mix the glass ingredients with a spoon, until the flour has dissolved; then set aside. Bring to a boil over medium heat the broth that was poured in the saucepan. When it boils reduce to low heat and strain over the saucepan the flour that was dissolved. Mix the saucepan ingredients and cook the white salsa from Yucatan for about 5 minutes, until it thickens; stir regularly. When the cooking is done remove the 2 epazote sprigs. Tip: Normally is not necessary to add salt to the salsa because very salty ingredients are used but if you feel that it needs a little salt, you can add it. Did you like the White Salsa? For this recipe a good strainer is needed. Some delicious olives of the Mediterranean. The salsa will look divine in this bowl.